Welcome to Muddaritaville Studio: I've traded one obsession for another! I know I'm not unique but for years I lived on the Real Estate listings website. I would critique the listings, if a link didn't work or information was wrong I would email the Realtor to let them know of the problem. If Frank and I went for a drive and noticed a listing, I could usually tell him about the house, the price and what the inside was like or I would complain about the lack of information with the listing. My Real Estate obsession was so strong I thought becoming an agent was my calling. I even enrolled in the course at one point, I brought the study books home and then I freaked out! OMG, what have I done, when will I have time to study, how do I fit this in to my schedule? Do I really want this? Anyway, I decided the timing was not right and if I were to reconsider I would not enroll on a whim next time. I wish I had started the blog Hooked on Houses, maybe I should start my Canadian version of Julia's blog. I'd share some fun interesting properties with you. Everyone can find your average city or subdivision home, I'm attracted to something slightly different. 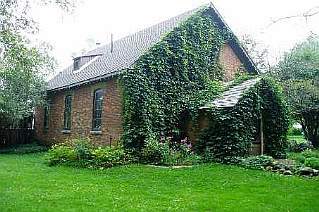 I love conversions: Schoolhouse, Barns and Churches. I'd share listings like this Schoolhouse on a 1 acre lot in the country. I wish the agent had some better pics. 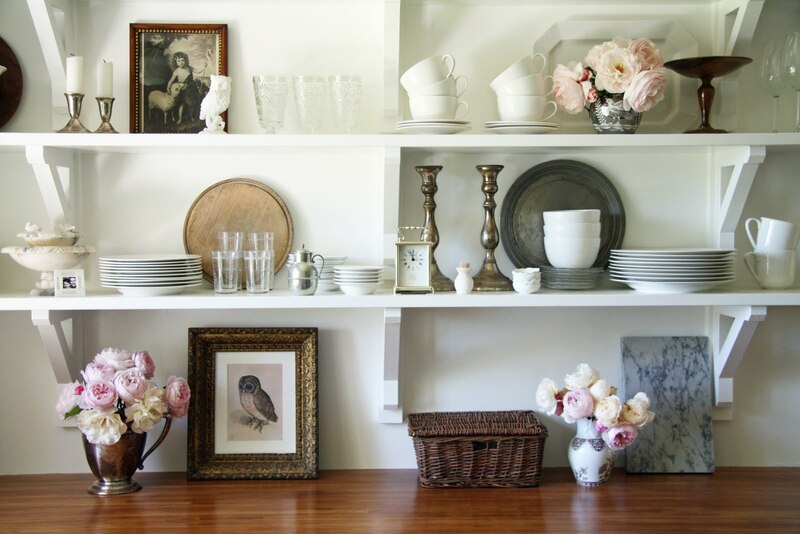 Maybe it's the lack of good pictures with so many Real Estate listings that has me drawn to my new obsession, Decor Blogs! Now here is a group of women that know how to take gorgeous pics of their home decor projects. Currently I follow over 100 blogs and I keep finding more. Following are a few hi lights from some of the blogs I am following. There's A Country Farmhouse, her open shelf kitchen makes me swoon, I love that she has posts on changing up her kitchen for the different seasons. Next Buckets of Burlap, her beautiful fresh decor with hits of chippy distressed items and yep, Burlap ... Loving It! Canadian Cottage, the makeover of their home is beautiful, I'm inspired by their new bathroom! 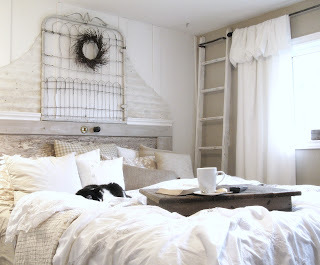 City Cottage, Jenny shares some of her makeovers along with updates from her beautiful store in Bowmanville, Ontario where she carries some of the most beautiful quilts, pillow and shabby chic decor items. 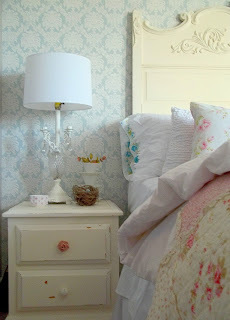 I love her recent bedroom makeover, I may have to pick up that wallpaper for our bedroom makeover. I'm going to feature one more tonight, I'll feature more later. I'm away from home for 2 weeks so I don't have any DIY projects to share, I'm going through withdrawal especially since everyone else is inspiring me with their makeovers. LOVE that schoolhouse! You've featured some great blogs! They're all "Must Sees"! Oh my goodness! I hear you with the real estate listings. I love any excuse to check out homes too. 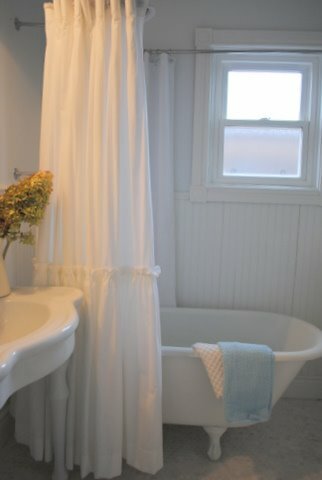 I'm just starting a staging/redesign business and one of the things I'd love to do is take better MLS photos. What do you think about that idea? (loved the schoolhouse too by the way).